Father Dan is currently serving as the pastor for St. Benedict Catholic Church. He grew up in Springfield, MA. After graduation he enlisted in the Army and served in Vietnam. Prior to following a call to priesthood, Fr. Dan was married for five years when his wife and child died during her sixth month of pregnancy after the onset of toxemia. Called to the priesthood, he began his journey in a Religious community environment as a member of the Marian Fathers in Stockbridge, MA. He studied in Washington, DC at the Oblate of Mary Immaculate College and the Dominican House of Studies, where he received a BA in Philosophy and a Masters of Divinity Degree. He was ordained at the National Shrine of the Divine Mercy in 1998 where he would eventually serve as Rector. Father Dan was a Pastor for eight years in Western, MA. He then served as a Parochial Vicar at St. Mary Magdalene Church in Simpsonville, SC. 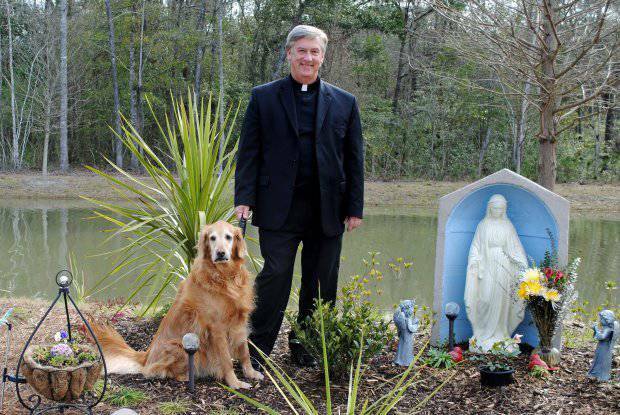 He now serves in the Diocese of Charleston where his family resides. On February 20, 2012 Father Dan was welcomed as the pastor of St. Benedict Catholic Church.